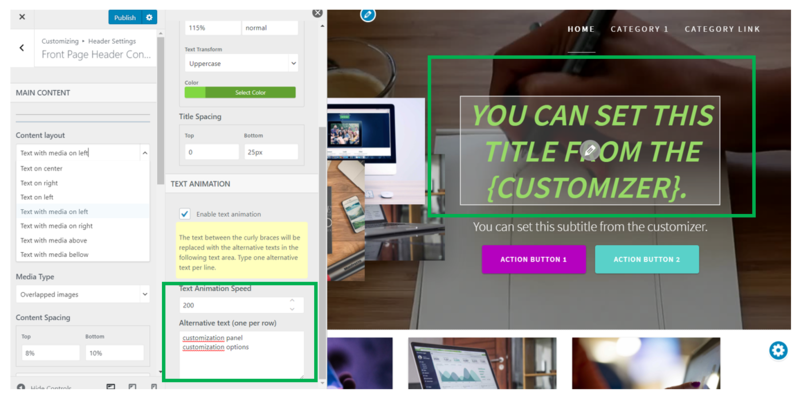 The Contents for the header of the front page can be customized, by following the steps defined in the customizer. Therefore, you are invited to explore the multiple functions this section includes. Go to the Customizer -> Header Settings -> Front Page Header Content. Main content refers to title (+/-image, video), motto and subtitle. Content Layout – the main content can be aligned to the right, to the left, at the center, or it can align media above, below, on the right or on the left. The Media Type can be represented by an image, a video, a video popup button or overlapped images. Note that there are pre-established media for each of these options, for you to easily see the differences in appearance and style. Content Spacing allows you to place the main content at a shorter or longer distance from the top, and to the bottom of the header (these parameters control the spacing above and below the header content). The Text Box Settings button opens a panel where you can configure the alignment of the text, and the space width destined to the text. The Media Box Settings button opens a panel where you can configure different elements of media you have chosen to appear in the header content. adjust the media column width. Content Vertical Align – allows you to set the content in the upper part, lower part, or at the centre of the header. If you leave the checkbox unchecked, the motto will not appear in the header. However, if you check the checkbox, you can further customize it by clicking on Subtitle Style. A panel will be displayed, where you can adjust the typography (font, font size, mobile font size, line height, letter spacing), top and bottom spacing, color and capitalization of the motto. The text animation can be speeded up or slowed down using the text animation speed option. Main Buttons – this is the default option if you choose buttons for your header. It displays 2 buttons (a Primary Button and a Secondary Button, that can be shown or not, according to your needs). Custom Buttons – this is an advanced customization option, in case you want more buttons (in fact, as many buttons as you like). To add a new button, you just have to click on Add New Button in the corresponding panel that opens. To edit the buttons, all you have to do is click inside the corresponding area within the preview on the right hand and begin the customization process. AppStore Buttons – for you to simplify the customization of these buttons types, we made possible the integration of Google Play Store and Apple App Store buttons, directly from a dedicated section.